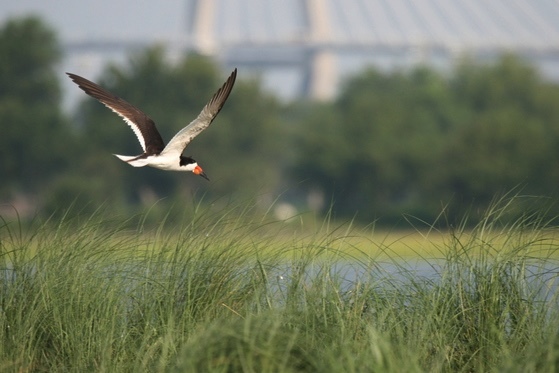 A black skimmer flies over the SCDNR’s Crab Bank Seabird Sanctuary in Charleston Harbor. (Photo by Felicia Sanders). Coastal bird populations face multiple threats, including habitat loss and degradation, human disturbance, increased predation and sea level rise, and an innovative public private partnership needs to raise $1.2 million between now and Dec. 14 in order to take advantage of a prime opportunity to address this problem in SC. Populations of many coastal bird species have declined by 70 percent during the last forty to sixty years, and the Palmetto State is a critical link in preserving these birds; numerous species of nesting and migrating birds visit our coastline each year, including a remarkable 38 percent of all the nesting brown pelicans on the East Coast during summer and some of the largest colonies of skimmers and terns in the Southeast. To help address the growing threats to these birds, the South Carolina Department of Natural Resources (SCDNR) established the South Carolina Coastal Bird Conservation Program, supported by groups including Audubon South Carolina, Coastal Expeditions, the South Carolina Coastal Conservation League and the South Carolina Wildlife Federation. The program’s first project, raising approximately $2 million needed to take advantage of a cost-share opportunity to renourish Crab Bank Seabird Sanctuary in Charleston Harbor, has gotten off to a good start, with more than $340,000 raised so far, but more is needed in order to meet the December deadline for SCDNR’s obligation to fund their portion of the renourishment project, with the U.S. Army Corps of Engineers providing the rest, a little more than $2.6 million. Crab Bank, one of five designated seabird sanctuaries owned by the SCDNR, has been nationally recognized as an Audubon Important Bird Area. In the past, Crab Bank has provided nesting habitat for as many as 5,000 birds in a single nesting season, including large colonies of brown pelicans, terns, black skimmers, egrets and herons, and a few dozen American oystercatchers. Due to wave erosion over the past 50 years and Hurricane Irma in 2017, all the available nesting habitat on Crab Bank was washed away, removing any opportunity for nesting birds during the 2018 season. A long-awaited dredging project to deepen the federal channel in Charleston Harbor holds the key to saving Crab Bank. Overseen by the U.S. Army Corps of Engineers, the “Post45” Charleston Harbor Deepening Project is expected to reach areas of the Lower Harbor in the early part of 2019, giving the Coastal Bird Conservation Program until December 2018 to raise the funds needed to help cost-share the renourishment of Crab Bank with the dredged material from the deepening project. As many as 80 acres could be restored, which would provide 28 acres of upland habitat for nesting and loafing coastal birds. “Crab Bank, if renourished, can produce hundreds of thousands of young birds over the next fifty years” said SCDNR Wildlife Biologist Felicia Sanders. Individuals interested in supporting or learning more about this important endeavor will find more detailed information on the Coastal Bird Conservation website at SCCoastalBirds.org.